We had a shoe box full of receipts with check numbers on every single receipt for everything we’ve ever spent. That’s not good enough. You need to have it listed where you can just go in and quickly access it, otherwise it’s going to take hours and hours. It takes a lot of organization to make sure you’ve got all the information you need to fill out the required forms for lay (non-professional) guardianship. The following tips come from parents who offer some good ideas for saving a little time and frustration when those guardianship reports are due. reimbursements made in a record-keeping book. Keep all your receipts. that don’t fit into other categories (e.g., furniture or credit card payments). Find out what your county requires. and what additional information you need to submit. occur. 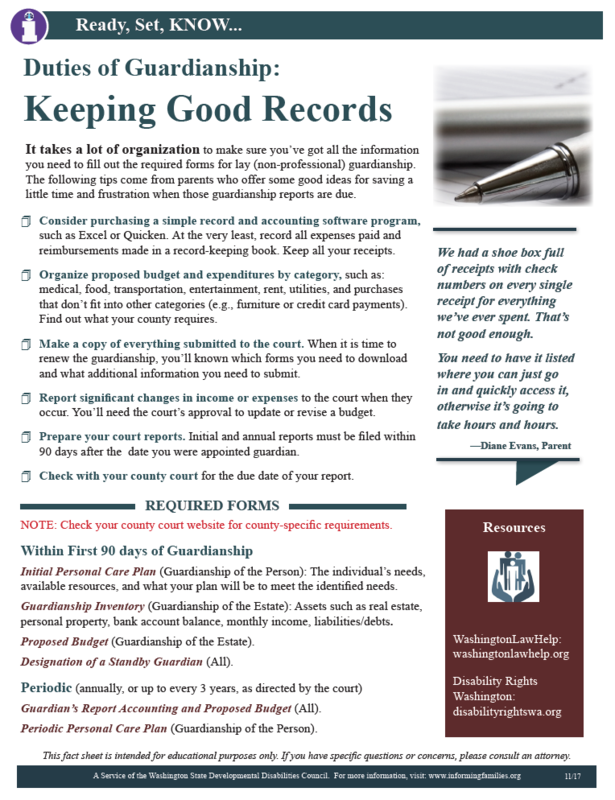 You’ll need the court’s approval to update or revise a budget. 90 days after the date you were appointed guardian. Check with your county court for the due date of your report. NOTE: Check your county court website for county-specific requirements. Initial Personal Care Plan (Guardianship of the Person): The individual’s needs, available resources, and what your plan will be to meet the identified needs. Guardianship Inventory (Guardianship of the Estate): Assets such as real estate, personal property, bank account balance, monthly income, liabilities/debts. Proposed Budget (Guardianship of the Estate). Designation of a Standby Guardian (All). Guardian’s Report Accounting and Proposed Budget (All). Periodic Personal Care Plan (Guardianship of the Person).